In this episode of the podcast I’ll tell you about a road trip I took in a large loop from my home in Cleveland, OH to Savannah, GA and back. There are some fun places to visit in between, and I’ll tell you about a few of those too. Also I want to give you some of my tips for taking a road trip. So why don’t I start there. My wife Becky and I have taken a lot of road trips. From our home base of Denver, CO for a few years we drove all around the American West, and the Southwest. We would take a week long vacation and pack up the car with camping gear, suitcases and coolers of food to go see some of the sites that are spread out around South Dakota, Wyoming, Utah, Arizona and New Mexico. We also made the trip back and forth from Denver to Cleveland, OH a couple of times to visit family back home. If you own a car that gets decent mileage, taking a road trip can be a good opportunity for budget travel. Plus it can turn into one of those situations where the journey is as much fun as the destination. I still like taking a good road trip and exploring small towns across America. When I hear the term Main Street, I have a picture in my head that is some combination of a lot of places I’ve been with 3 story brick buildings lining a road with parking on either side and quirky little shops here and there. Of course there is always a corner bar, and sometimes an old movie theater remains. Cheap food can usually be found in diners and pizza shops that have either been around for decades, or maybe just moved into a downtown that is having a resurgence in business. When you plan a road trip you don’t need much more than a map. I think a road atlas works well for laying out the route you want to take and getting a general sense of distances you want to cover. You can use online map sites like Google Maps or Mapquest, too, but my well worn Rand McNally road atlas has been one of the best tools we ever invested in. I think mine is from the 1990’s and I probably need to get a new one. I would also like to say that GPS is one of the most amazing and useful tools invented for finding your way around, but don’t rely on it without looking at some kind of map first. When you plan with a map you can look along your route and realize things like, “hey if we just go a little out of our way we can stop in Nashville for a few hours”. If all you do is hop in the car and plug in your destination to the GPS you might miss some great opportunities. I also like to get an idea of just how many hours I want to drive each day and plan out some towns to stop in overnight. Besides my outdated Rand McNally Road Atlas, I always stop at the first rest stop after crossing a state’s border. Most of the time they have a welcome center and will give out free state maps. These are the up-to-date paper maps for a state and usually have detailed sections for many of the major cities in the state. You can also use these welcome centers like you might use a tourist information office found in cities and towns across Europe. They will usually have a volunteer staff that can answer some questions, and they have brochures for all kinds of attractions. Now, Some of you may be saying, “No Duh, Lee we all know about rest stops”, but not everybody may know about getting the maps, since you sometimes have to ask for them. Also, I have actually seen a few International downloads of the podcast, so for you listeners around the world, I hope this helps in case you are unfamiliar with the freeway system in the US. One of the other things that I have always done on our road trips is to pack lunch and snacks. This doesn’t have to be complete junk food, but I find that eating a little something every hour or couple of hours helps to keep me more alert. We pack sandwiches and fruit for lunches, and we will either eat them while driving, or picnic somewhere along the way. This helps keep costs down, and is also healthier than eating nothing but fast food. That’s not to say we don’t get fast food, especially if we end up using a fast food restaurant just for a bathroom break. A handy thing to have if you think you want to do a few road trips is a cooler that plugs into your 12v cigarette lighter power in your car. These come in different sizes and will keep things cool, not ice cold. Its not as messy as dealing with bags of ice. Just remember to turn it off or unplug it when you leave your car. You don’t want to come out from a restaurant break and find your battery dead. With food on the road, I think the rule is “keep it simple”. Fruits, trail mixes and nuts, crackers or pretzels, and water bottles. Myself, I like to have a stock of diet soda too in case I need a caffeine jolt. Peanut butter and jelly sandwiches seem to travel well too, but we have gotten as exotic as making and eating hummus wraps. One advantage to taking your own car is that you can take your pet along. If your dog or cat travels well in the car around town, they should be fine in the car for a big trip. We have taken our cat across the country a couple of times, and once he got used to the fact that he was going to have to sit in his cat carrier for a while, he quieted down and seemed to enjoy the ride. If you stop at hotels, be sure to tell them you have a pet. Most will charge an extra fee or damage deposit if they accept pets, but have higher charges if they found you with a pet you didn’t tell them about ahead of time. One other thing to know is that state laws differ when it comes to leaving your pet in the car. Certainly on a hot day, leaving your cat or dog in a car with the windows closed could kill them. You should always make sure there is enough air circulation and provide them with water if you have to go into a restaurant or a store. If it is the middle of summer on a sunny day, just cracking the window an inch isn’t enough either. Just be smart about it, and also I will put a link in the show notes for a site that describes what laws are in different states pertaining to this. Road tripping gives you a lot of choices when it comes to lodging. Camping, budget hotels, Bed and Breakfasts, or luxury hotels can all be found on the road. If you are in a small town you might not get that luxury hotel, but if you are on the other end of the spectrum and want to camp, I have found that planning to stop at state parks, or national forest land can be nicer than the big name campgrounds like KOA or Jellystone, but they will do in a pinch. One quick note, is that traveling by car with kids can obviously be much cheaper than buying airline tickets for the whole family. I don’t have kids, so you can take my advice with a grain of salt, but my suggestion would be to keep them occupied with portable DVD players and video games. Things have come a long way since the days I had to either read a book or play I spy in the backseat with my sister. Also remember to shorten the distances you travel each day and make some fun stops. I am a planner and I’m all about being prepared for emergencies, so I always check things out on the car before a trip. If you don’t trust yourself or your car, take it to a mechanic you trust – I hope you have one – and just tell them your are going on a trip of however many hundred miles, and would they check it out. Probably fluids, brakes, tires, belts and hoses will be mainly what they are looking for. You can do mostly the same thing yourself. At a minimum, check the oil level, coolant level, and tire pressure. Put an emergency kit in the trunk that has jumper cables, tape, flares or orange cones so that if you have to pull off to the side to change a tire you can be seen. If you want more peace of mind, you can get roadside assistance insurance either on your auto policy, through some credit cards, or a club like AAA, which has a lot of other benefits like discounts at hotels and attractions. So now that we’ve planned the route, booked some hotels along the way and checked out the car, lets get on with the trip. When my wife and I decided to go to Savannah, we had a seven day spring break in which to do it. We also had a few sites and people to visit along the way, but with more time, we could have taken a few more side trips. Our route was planned out as Cleveland to Bowling Green, KY and Mammoth Cave, then on to Chattanooga, TN, and finally arriving in Savannah for several nights. After that we stayed overnight in Charleston, SC and then headed back north toward Cleveland with a last night left up in the air. I think of these quick stops like sampling at a buffet. Most stops are too short to explore a place in depth, but I get to breeze through and find places I might want to return someday and spend more time. I also kept the driving to about 5 hours a day, because I didn’t want to spend all day every day of my vacation in the car. Bowling Green is a college town, home to Western Kentucky University. There is a large teaching hospital where my cousin works as an ER nurse. Another attraction close by is the Corvette museum and plant. A lot of car aficionados come here to see where their Corvette was born, and to get a look at some of the models through the years in the museum. Also, my wife made sure to remind me that there was a big flea market at the same exit as the corvette museum. She saw it from the freeway and had to stop. She is a collector of well, lets just say stuff. If you’re a fan of any of the shows that feature pawn shops and American antiques you’ll love these kinds of places, and really that’s what road trips are all about. You can stop and check out something that interests you, and not necessarily what an organized tour will steer you towards. Also very close is Mammoth Cave National Park. http://www.nps.gov/maca/index.htm This is a place that we had been talking about coming to for years, and this trip was the perfect excuse. This is a huge cave system under Western Kentucky and I mean really huge. The main room looks like it was blasted out for tourists enjoyment, but it was slowly carved out by an underground river that is still flowing. There are a couple of different tours offered by the National Park rangers, and the one we went on was called the Historic Tour. It led down to a low point in the cave where we could see the river running across the rock, and the ranger explained that the room we were in at that point is completely underwater seasonally when the river is running full. There are stairs to climb on some of the tours, and if you visit the website located in the show notes, they have listings of each of the tours with details about how long they are and exactly how many stairs ar on each one. If you want to get into spelunking or caving, they even have an intro to caving tour that will lead you a little off the beaten tourist paths in the cave. After leaving Mammoth cave, we headed south again and stopped in Nashville, TN, known as Music City. The plan was to stop someplace interesting for lunch, but things didn’t go exactly to plan. It was Sunday and we were a little early for lunch. In the middle of Printers Alley which is supposed to be one of the hot spots in the city everything was closed. When I say everything, I mean everything. I eventually spotted a Starbucks, but it was also closed. Tennessee is on the north side of what can be collectively called “the South” here in the United States. People here are very passionate about their religion and church on Sunday. If you are traveling on a Sunday you can expect that many businesses will be closed, and there just might not be that much to do. If we had more time I would have stopped overnight for some fun at the bars and honky tonks or maybe a performance at Ryman Auditorium, home of the Grand Ole Opry. I’ll probably even do a show just on Nashville eventually because I have stopped there with my family on another trip. It’s a great town for live music. Instead of staying in Nashville, we opted to go a little further south and east to stay overnight in Chattanooga, TN. for many people the only reason they may have heard of this place if from the old song Chattanooga Choo Choo. Historically, the city was a manufacturing center and they now have a great preserved downtown. There are a bunch of different museums and some natural attractions and parks just outside the city. We just used it as an overnight stop but we did try out the Terminal Brewhouse downtown, and had a very good dinner in a multi story converted industrial building with some amazing craft beer. https://www.facebook.com/terminalbrewhouse They don’t advertise public tours, but I asked the server if there was anyone who would give me a tour of their brewing setup located on the ground floor below the restaurant, and one of the beer geeks there was happy to show me around. It just goes to show, all you have to do is ask and many times you can get a little extra fun in your experience. This stop was short, but mainly because it wasn’t the final destination but that is up next. Savannah is why we were headed down South. Originally neither Becky or I knew a whole lot about it, but we had some recommendations from friends and family. Savannah is on the eastern coast of the United states in the state of Georgia. It has history that includes being an important port in the 19th century and it was said that during the Civil War, the Union general Sherman who had burned Atlanta and everything else in his path on his march to the sea couldn’t destroy Savannah because it was so beautiful. It’s historic old town is laid out with streets lined with historic homes that open up to park-like squares every couple of blocks. You can navigate around the city by the square you are at with names like Chatham, Lafayette, Orleans and Madison. These squares are a perfect spot to sit in the shade of the huge live oaks and just take in the architecture around you. Even at night, it’s scenic and especially peaceful. This also makes it a very walkable city. There are only a couple of boulevards that aren’t broken up by these squares, so its easy to cross the streets and just wander around and find some hidden shops and museums. For literary fans, Savannah was the setting for the novel Midnight in the Garden of Good and Evil , which was made into a motion picture in 1997. It tells a semi fictional tale of the local characters around Savannah in the 1980’s. What I found to be the most interesting thing about Savannah, was that it has a mix of history, preserved architecture, and a weird individuality of a creative liberal culture in the heart of the American South. There is a River walk down by the Savannah river which used to be the main port for trade that originally fueled the wealth of Savannah. It is now a touristy line of bars restaurants and shops. You can find some pretty good seafood and southern cuisine here for lunch or dinner. An interesting fact is that it is legal to walk around with an open beer or alcoholic beverage. This is not typical of many places in the US, so I was surprised when a bartender asked me if I wanted a beer “to go” while we were on our way out the door. Like many rehabilitated old town cities, Savannah has a fair collection of art galleries. All kinds of fine arts and crafts can be found both down by the river and scattered around the old town. If you see one while walking around just pop in. You don’t have to go with the intent of buying something, but its nice to look at. There are also a lot of Bed and Breakfasts here. These are great for a weekend getaway or a week long visit to explore the area. Most are in historic buildings and you can get a little bit of history with your stay from a friendly owner. We stayed at the Savannah Bed and Breakfast Inn they have rooms spread out over several buildings very near Forsythe Park. We found that we could wander from here to visit the squares, the park and cemeteries, and with a bit of a longer hike, all the way to the river. This is great if you are going to visit some of the bars and have a few drinks, you don’t have to worry about drinking and driving. If you want to help pay for the costs to bring you this podcast and book a great B&B, and even the one I just told you about, you can go to www.journeyjournalonline.com/bandb . If you click the link there to go to one of the companies listed there it won’t cost you any extra money, but it tells them that you heard about them through the Journey Journal, and I’ll get a small commission to help me pay the bills so I can keep telling you about great places to visit. These are companies I have used myself, so I trust them to find a great deal for you too. 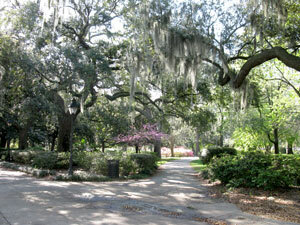 Overall, I would recommend Savannah as a destination for history buffs, or couples looking for a romantic getaway. You can get yourself lost on purpose and relax here. That was the best part… just relaxing. We somehow missed what was supposed to be a big attraction in Charleston which was the City market. It seems online like an interesting shopping trip, but instead we wandered around looking at the houses and gardens all around the old city. We also just hung out at the White Point Garden Park at the tip of the peninsula that contains the entire old town. We saw some very upscale shopping areas and ate at a very nice restaurant serving “low country” cuisine. One of the crafts that the area is known for are sweetgrass baskets. Handmade by locals and available in just about every size and shape imaginable, these baskets can be found for sale in galleries or directly from the maker on the side of the road. We bought one from a woman who had a shack at the edge of a supermarket parking lot, in the shade of an old tree. She sat and worked on one of her baskets while talking to us while we picked out one to buy and take home. They make a nice souvenir to take back and put in your living room, and I felt like I was helping out the local economy just a tiny bit. My highlight of Charleston was Patriots Point, which is a museum consisting of a docked aircraft carrier, submarine and destroyer. These Naval ships are World War II era craft that served even later into the 20th century. The self guided tour of the ships was really informative, and you get to wander the inside corridors on your own while imagining what life must have been like being out at sea for months at a time with a big crew. If you like aviation, there are also static aircraft displayed both in the huge hangar deck and on the flight deck. The only disappointment for me was that the destroyer was out for refurbishment, and my grandfather served in the Pacific on a destroyer in WWII. As of 2013 it is back and on display for tours so that just gives me a reason to come back, and I definitely want to. The submarine is a diesel sub that is much smaller than the Nuclear cold war subs you might have seen in the movies. Unfortunately it is also in need of an overhaul and its future is uncertain. Neither the museum nor the state of South Carolina has the funds so they are soliciting donations today to save it from becoming a reef off of the Florida coast. You can go to http://www.savetheclamagore.com/ to donate or find out its fate if you are listening to this sometime in the future. You can also visit www.patriotspoint.org to see pictures of the USS Yorktown carrier, USS Laffey Destroyer, and the USS Clamagore submarine. On the same day as Patriot’s Point we also visited Boone Hall Plantation. This is a working plantation still producing crops today, but also provides tours of the manor and grounds. The house is a reconstruction built in the Georgian style in the 1930’s but probably the most impressive aspect is the approach to the house. The long drive is lined on either side by massive live oak trees. Each row arches over the driveway to form a tunnel that frames the view of the house as you approach it. The tour of the house was interesting, but you only get to see the first floor, decorated as it might have been in the early 19th century. The house was featured in the 1985 TV miniseries “North and South” starring Patrick Swayze. this was part of the tourist draw for my wife who had watched the show when she was younger. Along the driveway is an area called slave street. These are cabins where the slaves of the plantation lived. The self guided tour lets you walk in and around the cabins, and has artifacts original to the plantation. There’s also an educational tour focusing on the historic Gullah culture. There are more historic buildings beside the house including the cotton gin house dating back to the mid 1800’s. The tour was topped off with an open air wagon ride through some of the plantation grounds highlighting the crops that used to be grown and the new cash crops that still sustain the plantation today such as strawberries, pumpkins, and other vegetables. If you are into Southern history, I’d recommend this stop for a nice afternoon. Our route home from Charleston was a long one. We were both out of time to spend away from work and school, so we took the most direct route home. Unfortunately there wasn’t a good destination stop that we knew of anywhere close to the halfway mark so we ended up picking a budget hotel just off the freeway. It was fine for what we needed, which was a rest and a bed for the night. There would be other options if you wanted to take a more scenic route. Asheville, NC would be a great option. I would allow an extra day if you want to go to Asheville, just to go to Biltmore Estate. Another option could have been to pop over to Roanoke, VA for a day. As it ended up, we found a nice park and took a walk, and ate at a local Mexican restaurant. The hidden gem on the way home is something we had passed several times on our way through West Virginia, but never stopped at before. It was the Tamarac Arts and Crafts showcase. Becky is a big craft person, so I relented to her pleading and stopped. It is a single large round building right off of the freeway exit that is a shopping stop for anyone who likes artisan handiwork. They have artist in residence in studios inside, and feature wood crafts, pottery quilts and clothing as well as other art and sculpture. After that it was home to our cats and chickens. Some people don’t like driving, so I can understand a road trip might not be for everyone, but if you have a willing travel partner, especially one who can share in the driving and the navigation, road trips are a really affordable way to get up close with an area of the country that you might not see if you just jet from big city to big city. Our trip took us over 1800 miles and we both had a wonderful time and discovered that we want to return to Savannah for a longer stay, so when I get there I’ll be sure to let you all know so you can stick with me and keep listening. I appreciate every one of you who are listening and if you like it or you know someone else who might like it, please share me with your social network. The blog is at www.journeyjournalonline.com, and I am on Facebook at facebook.com/journeyjournalonline. I am also listed in the iTunes podcast directory, and if you use iTunes, please stop by and give me a rating. That would really help me to show up when people search for travel related podcasts and tell my stories to even more people. Thanks again, and I’ll talk to you soon. Until then, enjoy your journey.